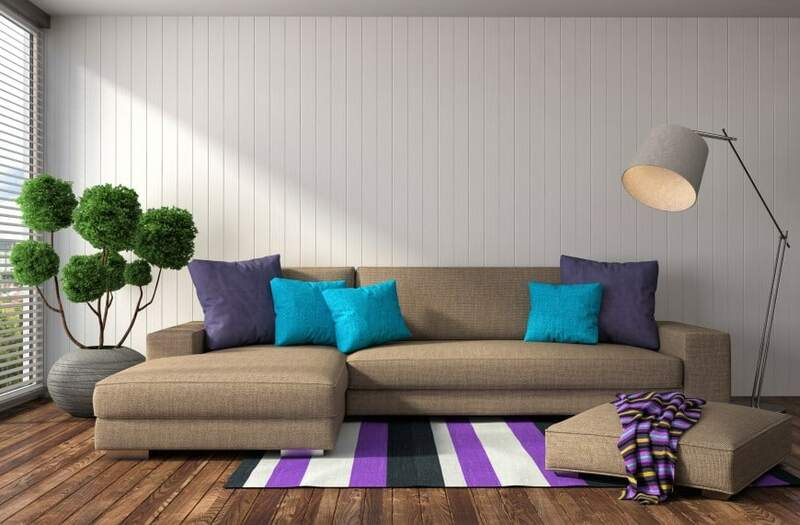 From sleek modern to traditional, there are many types of sofas. Although people say “couch”, the experts prefer the term sofa. Other words for them are “davenports,” “chesterfields,” “divan,” “settee,” “Lawson style”, “Cabriole” and more. Here are 12 popular examples of sofa styles. 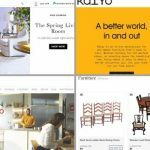 In this article we will describe 12 popular sofa and couch styles/types with pictures for each one. Furthermore, we include 25 more images of different sofa design styles for getting ideas for your own home. What is the most popular sofa style? What is the difference between a Chesterfield and a Couch? The Chesterfield became so trendy that “chesterfield” is synonymous with “couch.” Philip Stanhope, 4th Earl of Chesterfield in England, commissioned this classic leather sofa over 200 years old. It features deep tufts in the upholstery; a back that is level with the arms; and a low seat with exposed legs. Some manufacturers use other materials, such as canvas, tweed, and denim. The Lord himself commissioned the first of its kind because he required “furniture that would allow a gentleman to sit upright in the utmost of comfort allowing sitting without wrinkling the garment.” That made the Earl quite the trendsetter of his day. Easily identifiable by its deep-buttoned upholstery, nail head trim, matching back, arm heights and distinct silhouette, Chesterfield sofas have survived time, retaining distinct characteristics that remain rooted in the past, yet you’ll find plenty of contemporary (and even modern) versions of a sofa that continues to remain the de regeur furnishing style for stodgy men’s clubs. Original Chesterfields (often referred to as “plump” and “plush”) can be identified by the sofa’s “blunt arrow feet,” but don’t be surprised to find latter-day Chesterfields atop block-, bun- or ball-footed legs. Having brought the Chesterfield into the 21st century, don’t be surprised if you find couches paired with a variety of complementary chair styles. In fact, it’s said that Sigmund Freud’s therapy couch was a Chesterfield, so if you have something to get off your mind, your sofa-buying decision may end here. A loveseat is a medium size, upholstered sofa that seats two adults. 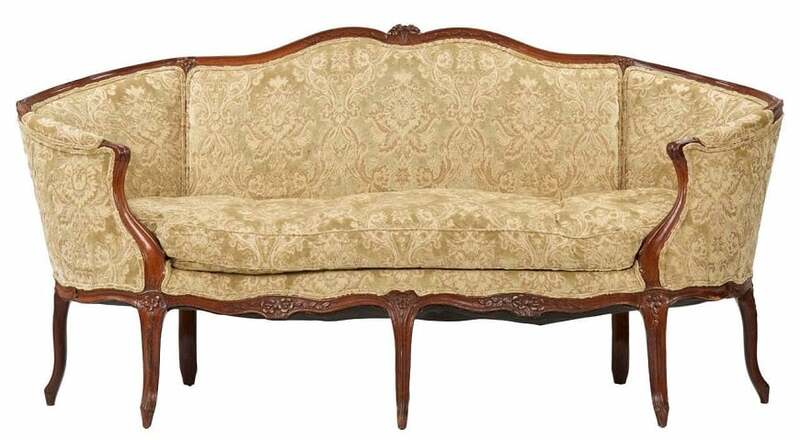 Furniture makers in the 1800s designed these sofas for ladies with large skirts. They were oversized chairs, not seats for lovers. Early loveseats had high back and arms to block the drafts in the uninsulated homes. Today’s loveseats come in all styles. You can order one with plush velvet tufted upholstery and ornately carved wood legs or with brightly colored micro fiber cloth and no visible legs. They are the perfect seating unit for small rooms. Another advantage of the loveseat is the cost because it usually costs a fraction of what a full-sized sofa does. When decorators look for ways to create efficient seating arrangements, pairing a sofa with a loveseat does the job. Common features typically include bench-style seating for two or more in a style that mimics a sofa design, but in a shorter version. Loveseat styling is as eclectic and varied as larger seating units, so despite sizing differences similarities abound. 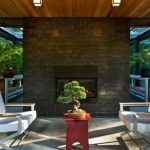 Construction may feature either kiln-dried solid or engineered wood frames, steel coil suspension and cushions filled with a choice of materials. 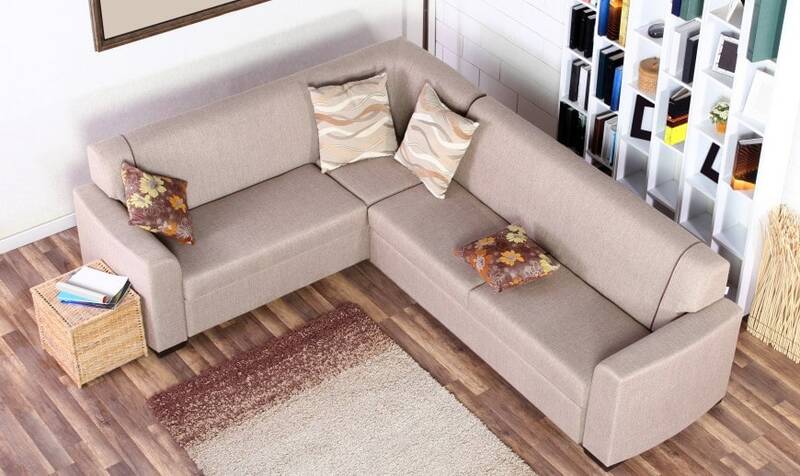 Sleeper sofas are one of the most versatile pieces of furniture. Other names include couch bed, sofa bed, hide-a-bed, or sleeper-sofa. The choices range from a sofa that extends out to be a queen-sized bed to a small loveseat that converts to sleep one person. Stores offer many styles and materials for these units, from luxurious leather to casual denim. Most sleeper units pull out with a metal frame supporting a thin mattress. Others fold down with the seat and back cushions creating a flat bed, such as futons do. Some couches convert into bunk beds. Another option for overnight guests is the sectional sofa that converts to a bed. You can buy this seating unit in several sections and arrange them to configure to your needs, such as an L-shape (like the above) or a U-shape. Some companies make rounded pieces so you can have a curved sofa. Due to the sectional nature of the pieces, they commonly are modern and boxy in style, but manufacturers are producing unique pieces. 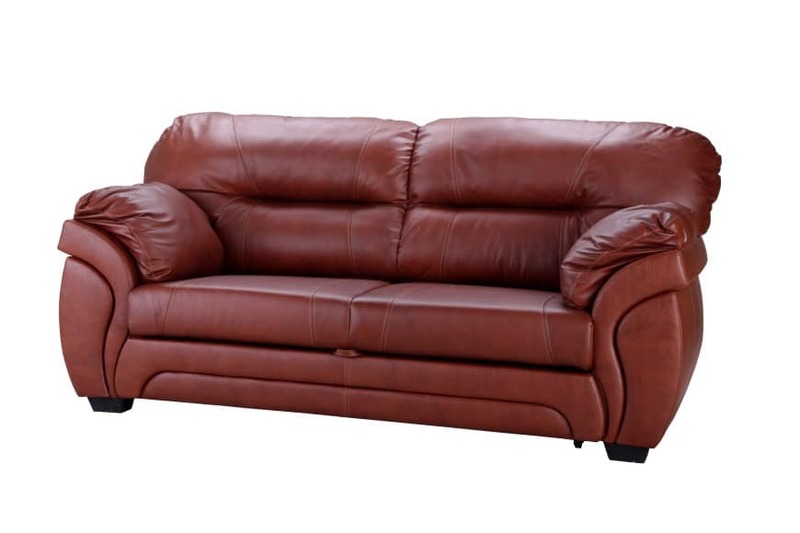 For example, you can purchase a sectional that resembles a wood-trimmed camelback sofa. While a traditional couch may provide seating for two or three people, a sectional couch offers more seating. 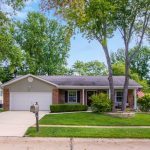 The entire family can have space on a sectional couch, which is often comprised of a three-seat couch and a two-seat couch. Sectional couches are also available in a wide variety of styles, colors, and materials. The downside to a sectional couch is that the two pieces of furniture take up a lot of space. 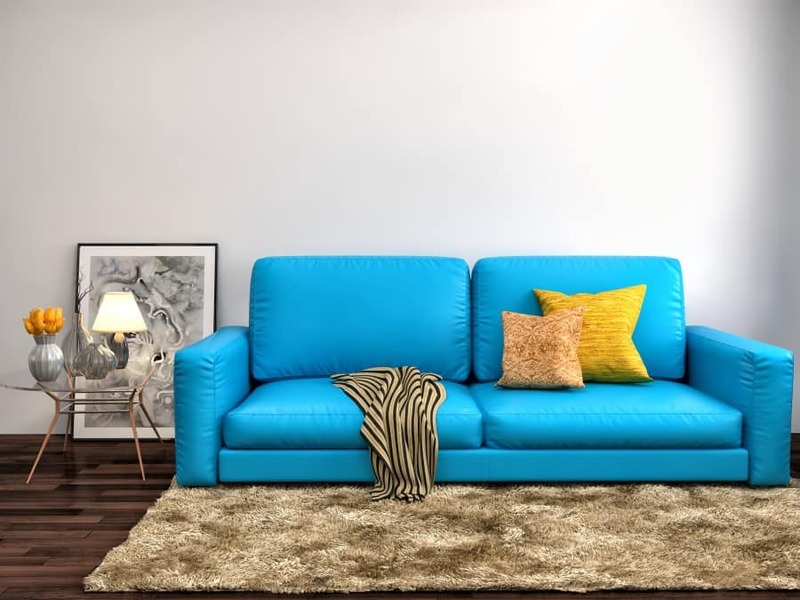 Depending on the size of the room, a sectional couch may provide limited options for rearranging furniture. This can make home decorating more of a challenge. These couches can also be difficult to move or transport. Like the loveseat, the daybed comfortably seats one or two people. The daybed converts readily into a sleeping unit. The average size of the daybed sleeper is a twin bed or approximately 39 inches by 75 inches. Some companies offer a trundle bed that slides out from under the daybed, creating two twin beds. Daybeds come in all styles, from modern to elegant. Many people buy infant beds that convert to daybeds as the child grows. You can find a daybed to fit almost any style of décor. One very modern trend is the recliner. Originally, people bought reclining chairs, but manufacturers saw a need for reclining units in sofas and loveseats. Although the most commonly sold are in the casual style with rounded arms and plush backs, you can find recliner sofas in other styles, such as the mission style or modern styles. 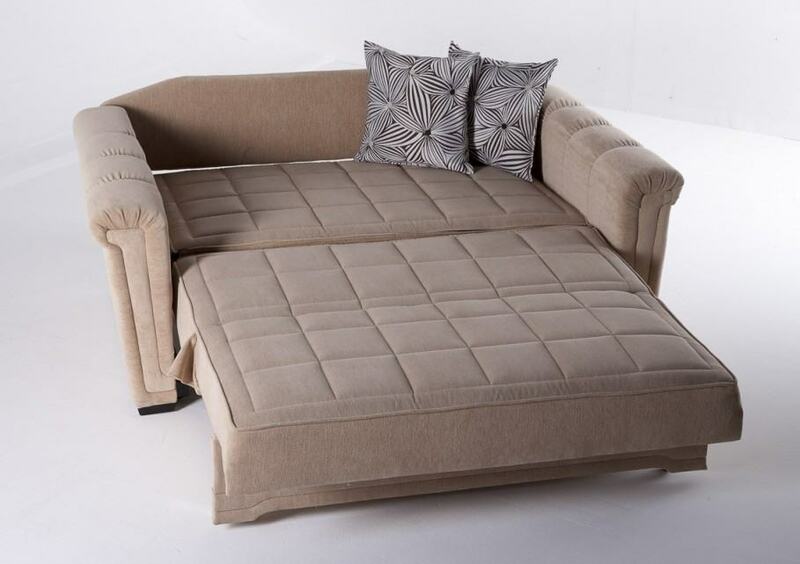 Similar to a bench, the divan has no back or sides, although you may find variations that have arms. Most people place the unit against a wall and arrange pillows for people to lean back on. Divans are not as popular as more comfortable seating pieces. 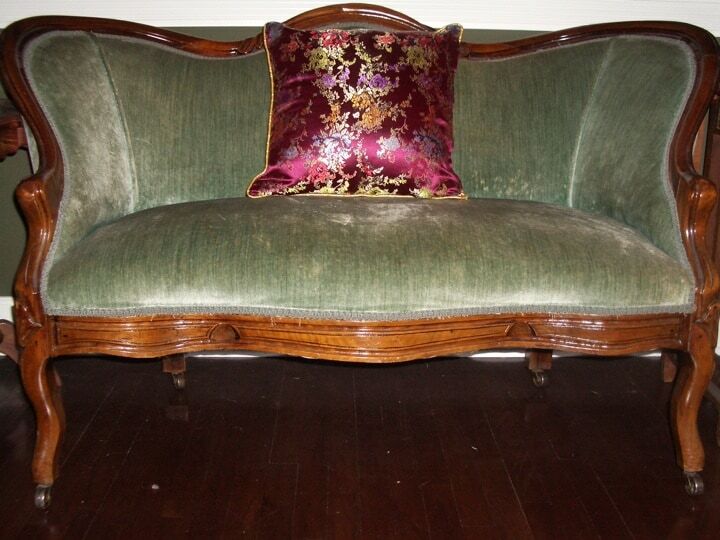 Originally, settees were long wooden benches with backs. Over the decades, people improved them with upholstered seats and backs. Today, the term “settee” is almost synonymous with “sofa.” It may or may not have arms. The legs are always visible, giving it an airy or lighter look. If you appreciate the history associated with the Lawson style sofa, mention financier Thomas Lawson to friends before they take a seat on today’s version of this fuss-free furnishing. Decorators may call the Lawson a chameleon: Clean lines mean you can put this couch into any style room you like and it will fit perfectly. Lawson himself is the guy behind the design–his financial proclivities reflect a desire for the polar opposite of fussy Victorian furnishings considered trendy in parlors at the turn of the century. One thing is for sure: a Lawson style sofa is the very definition of classic. 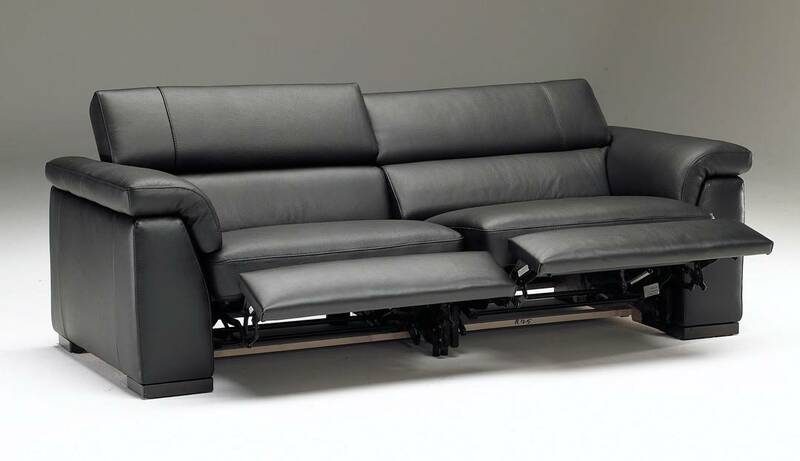 The Lawson style sofa is infinitely adaptable so you can choose between a regular Lawson sofa or a convertible sleeper. While practical and no-nonsense, Lawson sofas are neither bland nor unimaginative! When you shop, you’ll run into contrasting fabrics and trim that separate one type of Lawson sofa from another. 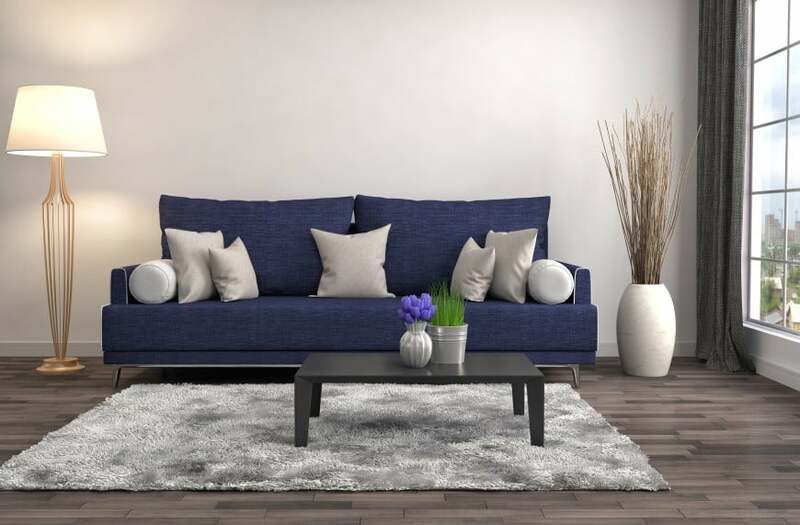 Get your sofa home and as long as you select contrasting throw pillows to provide some contrast, this couch won’t have to work hard to reflect your personality. Wonder what Thomas would have to say if he saw that his original idea for a no-frills couch is still in production in 2018 and beyond? If Lawson sofas are the chameleons of the couch niche, Cabriole-style furnishings are on the other end of the continuum. French in flavor (hence the name that translates as caper, somersault or cavort), this sofa is playful, sensuous and unpredictable, thus if you spot a sofa with an exposed frame, exotic curved back, loose seat cushions and a wealth of carved details, there’s a good chance you have correctly identified this furniture style. Will the Cabriole sofa fit in to traditional settings? That depends upon how eclectic your personal style happens to be. You can pull off pairing this sofa with other periods, say decorators. 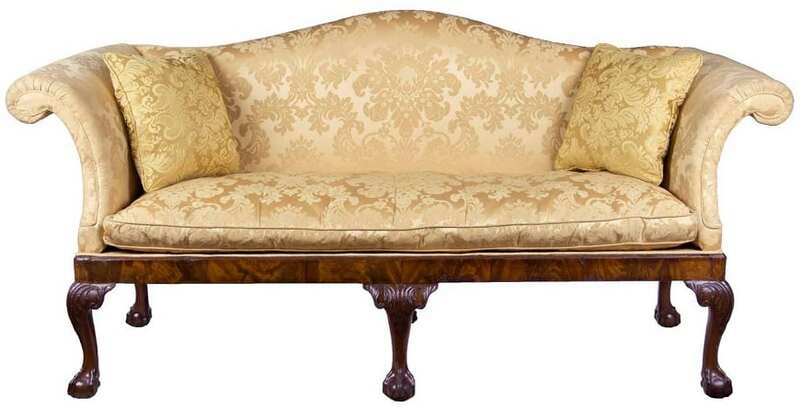 Cabriole-style sofas represent evolved Queen Anne- and two King George-era looks, all of which feature distinctly carved legs with pad foot designs found in mid-18th Century furnishings in Britain and America. Consider the Cabriole-style sofa’s distinctly “curved inward” arm silhouette that complements those dramatic legs and it won’t be hard to insert plenty of elegance into a room’s ambience. Though woods and trims contribute greatly to the distinct look of the Cabriole sofa, furniture designers are not shy about making intricate textiles like brocades, velvets, satins, taffetas and other luxe fabrics the stars of the show—-just as long as those patterns don’t interfere with the signature back rail that’s a dead giveaway when a Cabriole sofa is displayed with sofas from other periods. Professional decorator Laurel Bern says that the Bridgewater sofa has “aliases,” so you could find the style you seek by looking for English roll arm sofas when you shop if you can’t find one that’s labeled a Bridgewater sofa. 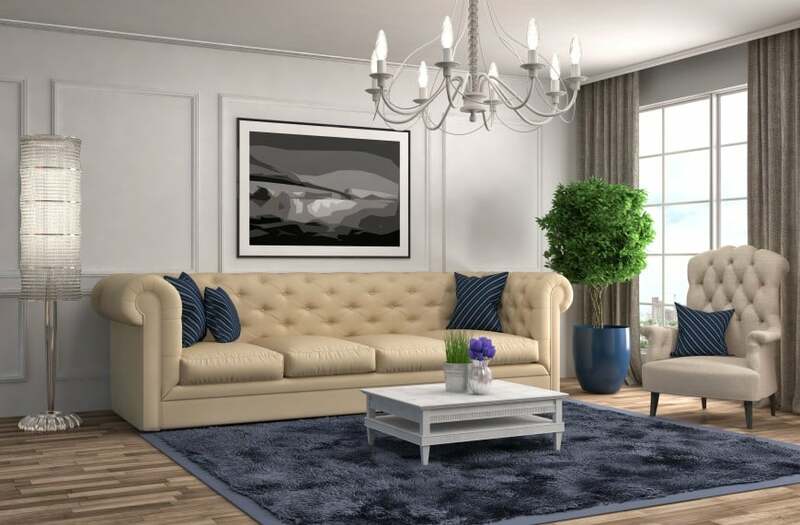 This seating style is known for having a knack for fitting into contemporary room settings-even if Bridgewater sofa you find comes from an antique or thrift store, since this style has been manufactured for so many decades. Like the Lawson, the Bridgewater or English rolled-arm sofa features a high back and low arms. Many Bridgwater couches have skirts that hide the legs, but contemporary models styled by today’s furniture makers may expose those legs instead. You can try to identify the Bridgewater by the loose seat (possibly with 2 large seat cushions) and back cushions and separate this design style from copycats by peeking beneath the slipcovers. If you spy wooden or metal arms and backs, you’re a step closer to the origin of this furniture style. Formal or casual, this sofa style works with other furnishing styles, though for Bridgewater purists, nothing but coordinated chairs will do. Take a seat and experience the spring-reinforced construction that makes this sofa supremely comfortable, even if you sit a long time. Because interior springs are a particularly important part of Bridgewater anatomy, if you’ve decided on a vintage store buy, make sure that there are no protruding springs that can ruin this sofa’s best asset: comfort. If you’re feeling confused because all of the contemporary sofas profiled in this review look so much alike, you’re not alone–but you won’t have the least problem identifying a Camelback if you’re familiar with the desert animal that lends its name to this distinct look. Your buying decision could be based on whether you fancy one hump or two because Camelback sofas are extremely versatile. Some feature single-cushion seats paired with skirts that cover couch legs and feature sewn-in pleats. Others come with exposed legs. With origins dating back to the 18th century, you’ll find some Camelbacks not only have a single hump in the middle, but at each end of the sofa, the frame may also rise slightly to create a wavy silhouette. Camelbacks can be found that feature Cabriole legs—at which point they can be identified as Queen Anne- or Chippendale-inspired, but if you find a Camelback with tapered legs, you may be in the presence of a Hepplewhite design. Furniture shoppers who can identify the back of this couch and love the style (but aren’t much into proper names) often ask gallery associates to show them “Hump-back” sofas. 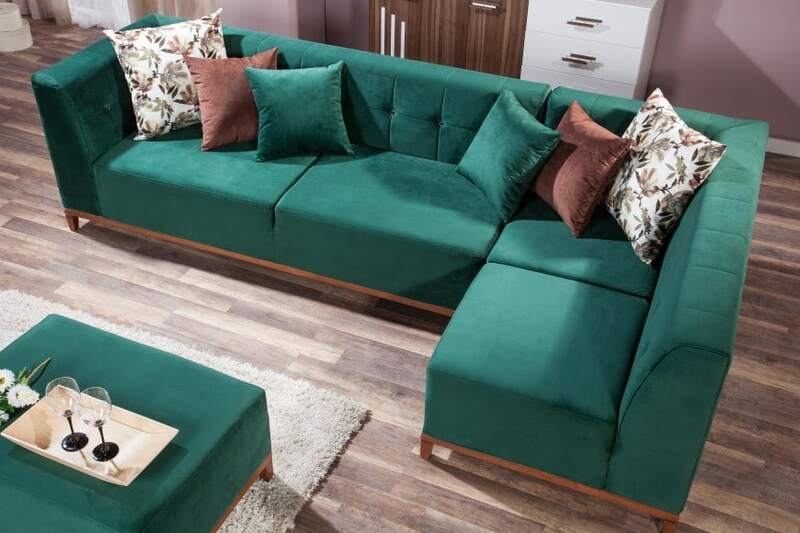 Have a look also at the following 25 Sofa pictures to get inspired about more sofa styles that you can choose for your home. A Chesterfield sofa never goes out of style. With rounded arms and a buttoned back it is the epitome of luxury and high class, and can be a great addition to any living room design – from classic to contemporary. If you would like to add an extra dose of comfort to your living room, look no further – this bulky leather sofa may be just what you need. It has smooth curves and soft padding, and is the perfect spot to sit down and relax. L-shaped sofas are a great way to add an extra sitting spot if your room is too tight for a whole sofa set with armchairs. An L-shaped sofa is a great choice for tiny apartments, as it doesn’t take up much space and can easily fit in the corner of the room. Here is another L-shaped design with a more modern appeal. It is simple in design, but a finishing touch in bright turquoise makes a bold statement. What a great way to turn a regular sofa into an eye-catching accent piece! 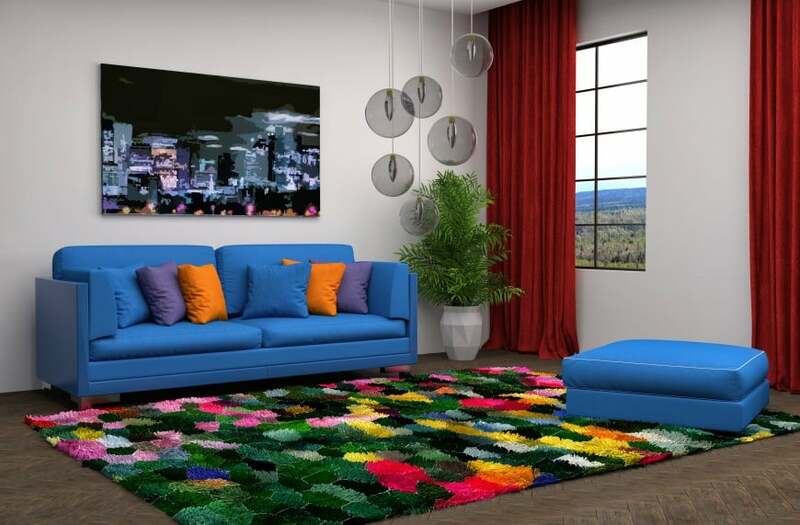 Have a look at another bright-colored sofa design. This loveseat is a great choice for a young couple’s modern apartment, and can be matched with a colorful set of throw pillows to make an even more vibrant design. This modern set consists of a two-seat sofa and a square ottoman in blue, that can be a great addition to your modern living room design. If you are feeling adventurous, you can match them with a motley carpet and colorful abstract wall art. Bright colors are great, but nothing speaks of class and elegance as much as a monochromatic design in dark gray such as this one. It truly gives off a vibe of simplicity and style that makes you fall in love with it. 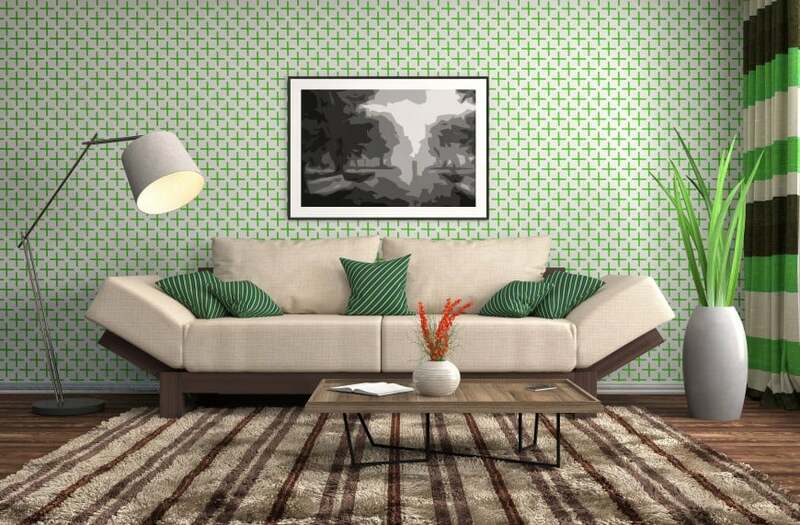 Here is yet another vibrant design with a neutral-colored sofa in light beige. Neutral shades are always a good choice for any room as they can be easily matched with a wide variety of colors. Have a look and see for yourself! 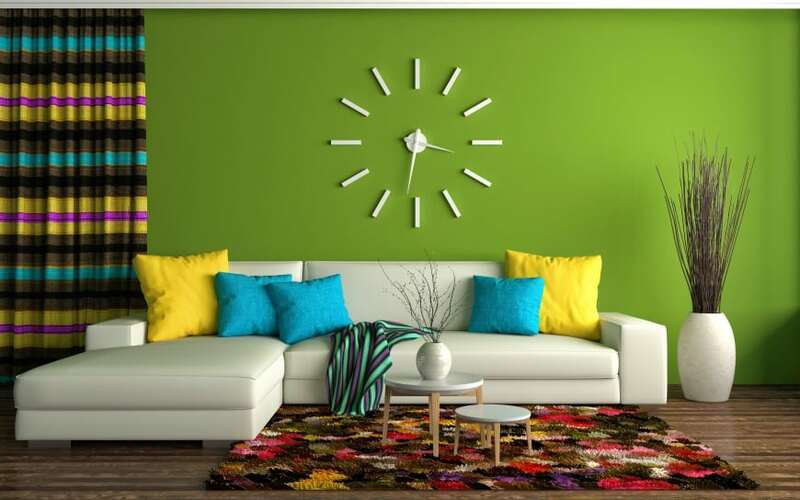 Lime color has been on the rise for quite some time now. It is a huge trend in interior design and can be used as a main or accent color in wall finishes, furniture and accessories. 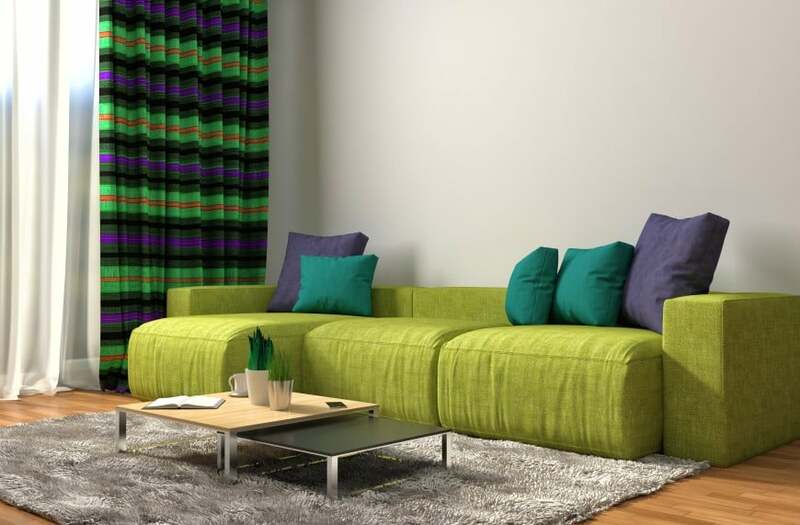 A lime-colored sofa, for example, can be a great accent for your living room. 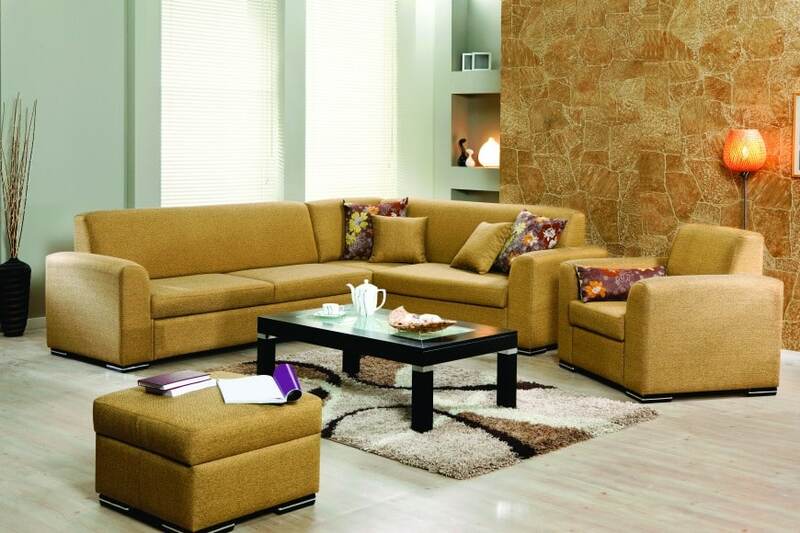 Here is a set of golden brown seating – an L-shaped sofa, a comfy armchair and a square ottoman. Warm earthy hues always have a special psychological effect, as they inspire a feeling of comfort and warmth, which is just what we need in our living rooms. This gray L-shaped sofa set with an ottoman stool is a perfect choice for a modern living room interior. Don’t be afraid to finish it off with vibrant accessories – a couple of pillows, a rug and a warm blanket will do just fine. 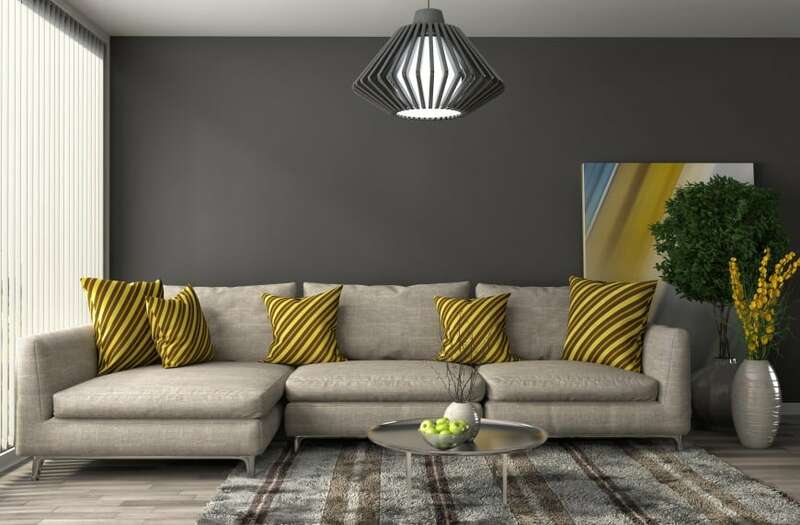 Here is another grey sofa design. Grey is often underestimated as a color, as it may be perceived as dull and boring, but don’t forget that you can easily combine it with a large variety of colors to make the design more varied. This modern living room design feels nice and cozy. It looks highly sophisticated and is rich in color and texture. Dark wood and earthy hues are an elegant choice that is enhanced by eye-catching accents in green. Here is another exquisite design set in elegant shades of grey. Here we have a modern L-shaped sofa, a designer pendant light and a silvery round table. Color accents in yellow complete the design and bring it to life. Teal is a color that will turn any sofa into a cool accent for your neutral-colored living room. Add a coffee table ottoman of a matching design and a beautiful set of colorful throw pillows, and you are all set! 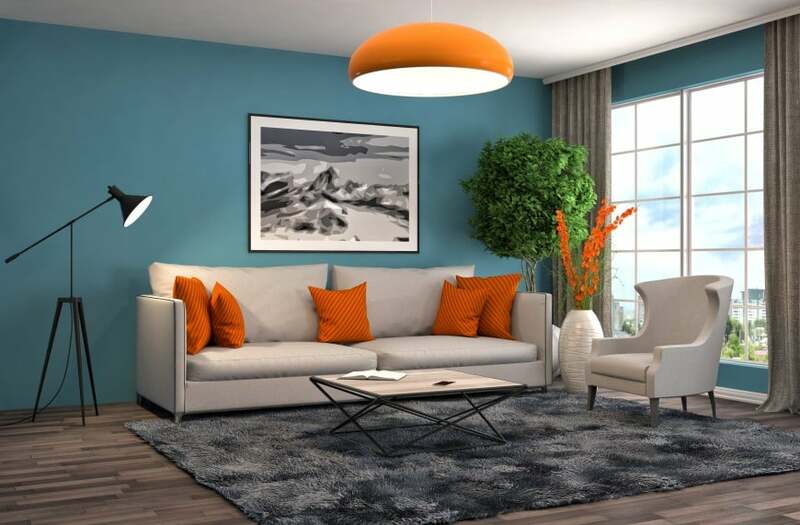 Orange is another eye-catching color that can turn a plain living room into a cheerful interior space. Here it is matched with gray and blue that bring the whole design into balance. Here is a living room design idea that is packed with style and bursting with color. It is rich in texture and patterns, and features a beautiful blue sofa with rounded arms. A buttoned armchair of a matching color completes the design. Here is another modern sofa design idea. 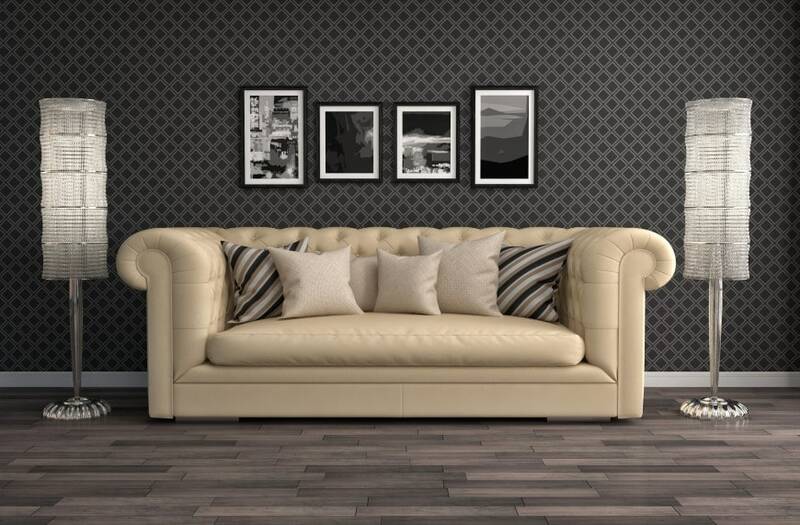 Clean lines and soft padding are the way to go for an extra dose of style and comfort in your living room. Patterned pillows in purple and blue put the final touch to the design and add a dash of color. If you are having trouble picking out a color for your living room, then go neutral. You can never go wrong with a beige sofa, plus it is super easy to match with any color should you choose to redecorate at a later stage. Here is another elegant solution for your living room, this time with a dark blue sofa. It is evenly decorated with a set of light grey throw pillows, and a beautiful selection of interior accessories completes the design. 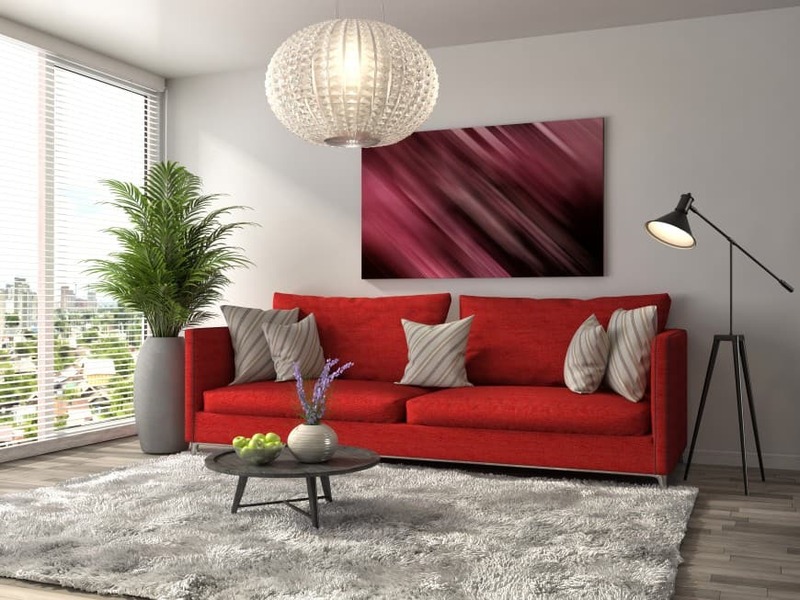 Red has always been a bold color choice in interior design. It makes a great accent in a neutral-colored setting and brings a whole lot of vibrancy and passion into the design. It is a great color choice for a sofa, as well. Here is another vibrant take on living room design with an orange sofa and a red armchair. This splendid design idea is bursting with color, yet perfectly balanced with dark grey shades throughout the space. This modern interpretation of a classic Chesterfield sofa really is something. 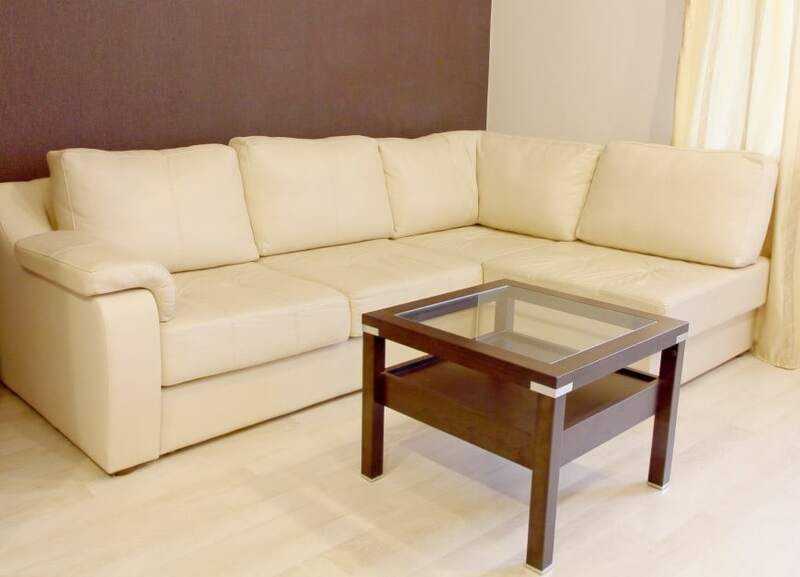 It has a cool sleek appeal in light beige leather that will fit right into any living room design. With curved details and soft padding, it will surely provide you with a high level of comfort and style. Here is another inspirational idea with a large Chesterfield sofa in beige. It has the signature buttoned back and rounded arms that we all love, and is decorated with a set of blue striped pillows. Green design has been a huge trend recently. 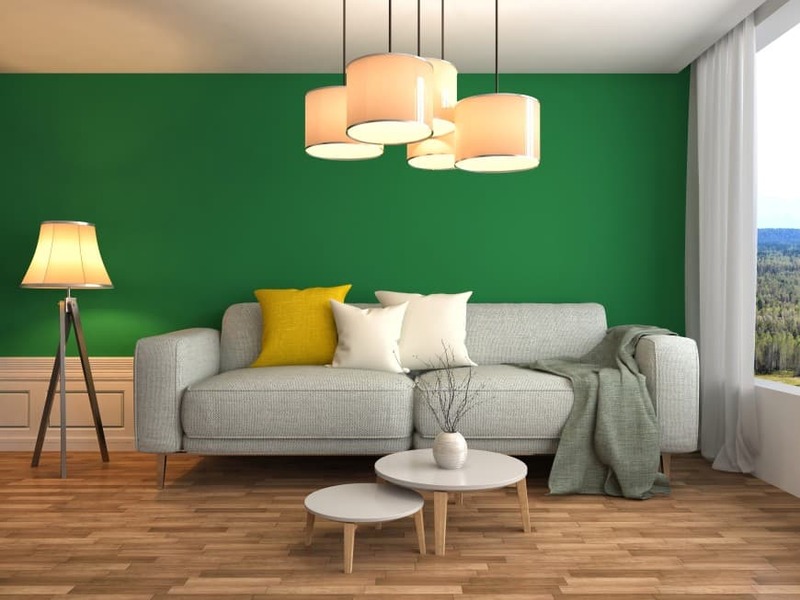 With this living room you can join the fuzz and go green… literally. 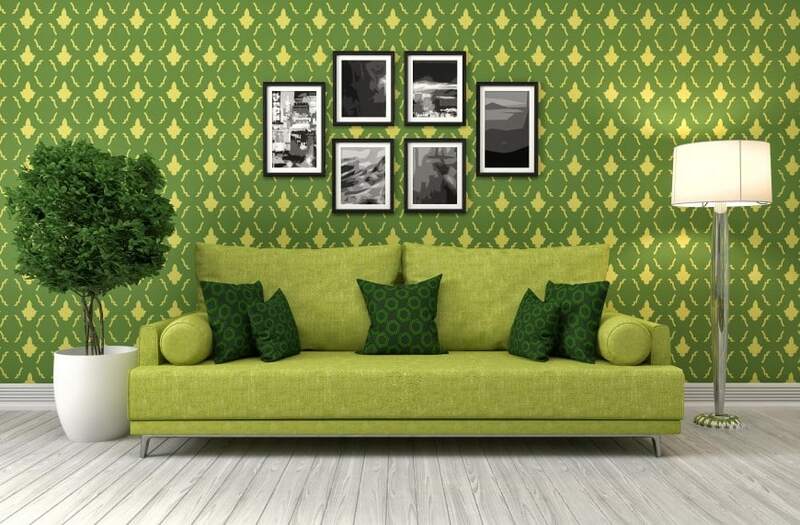 Have yourself a lime-colored sofa with dark green pillows, all against a patterned feature wall in… you guessed it – green! If, in your opinion, there is nothing more perfect than a soft, squishy sofa pillow that makes you feel as though you are sinking into a cloud, hollow fill fiber may be your choice. These sofa cushions require TLC: you’ve got to plump, fluff and otherwise re-shape this type of cushion and it’s wise to rotate them regularly so the content wears uniformly. Soft hollow fill material is regularly used for couch cushion backs, even when seating cushions are filled with molded foam. 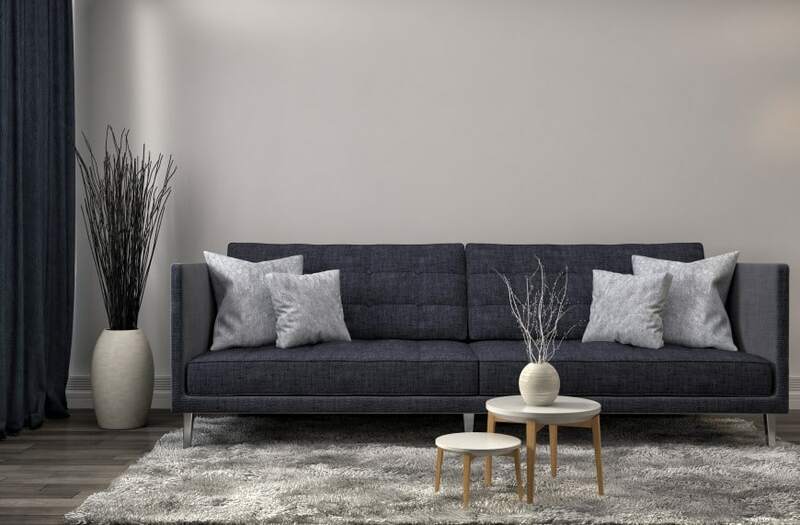 For folks who demand a firm option when it comes to finding the ideal sofa cushion, the answer is molded foam, a space-age option that only requires the occasional turn to keep its shape for many years to come. Relatively few puckers or content shifting is experienced with molded foam sofa cushions because foam is so rigid. If you like a streamlined, tidy appearance, foam should be your first choice. Feather fill is preferred by traditionalists because it provides a similar sitting experience to hollow fill only the stuffing is not a synthetic. Soft, cushy and easily maintained by plumping and shaking to disburse feather lumps, this cushion fill is ideal for sofa cushion back pillows even when molded foam is used for the seat cushions. Coils have been around forever, but you rarely find them the only fill in today’s sofa cushion. 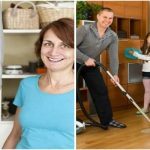 Coils often provide the inner stability a cushion needs to sustain years of use, but they are often just a base around which sheets of foam, fill or even feathers provide the cushion needed to deliver the comfort today’s homeowner expects. –Luxe fabrics like velvet plus stitching and embellishments like button tufting and quilting are also on trend. Alternately, the term Chesterfield is neither French nor Arabic, but its roots are equally elegant and historic. If you are a huge fan of PBS series “Downton Abbey” or “Victoria,” you’ve seen plenty of Chesterfield chairs, sofas and couches. 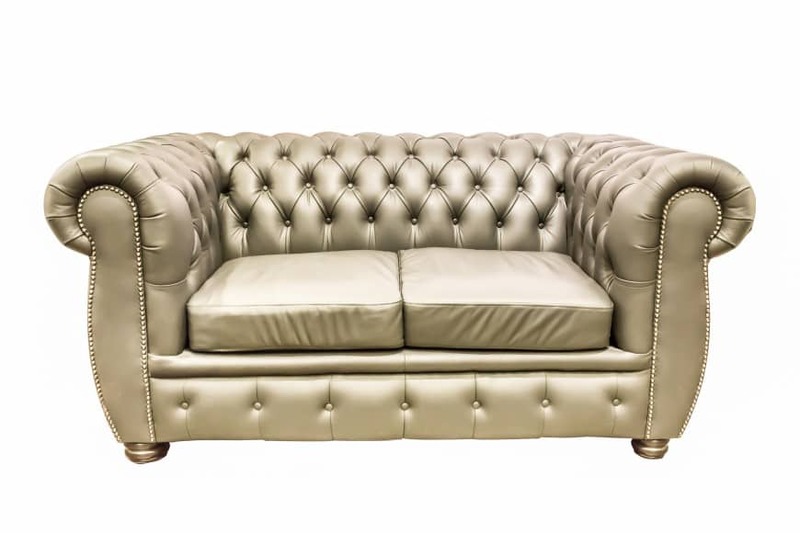 Chesterfield pieces are frequently crafted of leather, but no matter the textile, they’re always lavished with button-tufting and rolled arms that match the sofa height. Craftsman inspired by Chesterfield pieces have introduced 21st Century versions of these Victorian originals, but if you’re looking for a single differentiation clue, this is it: if it’s lavished with button-tufting and the arms are located at back height, you have probably encountered a Chesterfield rather than any another couch style. While reading this article, I recalled myself standing in a sofa showroom with 5 different types of sofas in front of me with no Idea how one was better than the other. I hope after going through this article I would now be able to point out certain differences. 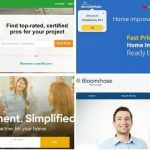 I think there can be few other important key things that can be added to this article to make it the perfect one.